Testifire 2000 Series is the world's first multi-stimulus detector tester for smoke, heat and CO fire detectors. Smoke, heat and CO stimuli are created in a single test unit, and delivered individually, or - for the first time - simultaneously; in whichever combination are required. Testifire does this without using pressurised cans of gas or other hazardous goods. Stimuli (Smoke, Heat and CO) are generated at the time of test using safe and patented processes fuelled by replaceable capsules. 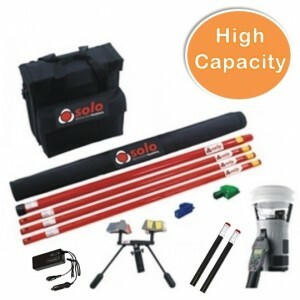 The new SOLO770 Battery Baton is a higher capacity product (3000mAh). It allows greater efficiency both in the field and on site, as it gives more tests per battery, for the same charge time as before, but provided by the new SOLO727 Battery Charger. The SOLO727 charger has also been improved and, while it provides the same functionality as before, it is now capable of enabling fast charging of the new, higher capacity battery batons from both mains power and in-vehicle outlets.